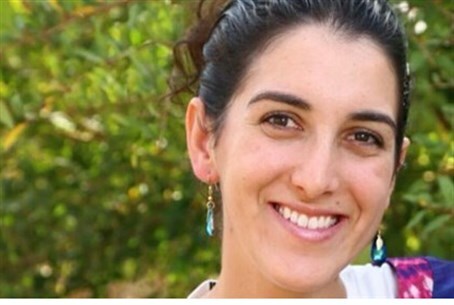 Dalia Lemkos, 26, of Tekoa, identified as the woman murdered in Gush Etzion. Her funeral will take place tomorrow morning at Tekoa. The young woman murdered Monday evening has been identified as 26 year-old Dalia Lemkos from Tekoa in Gush Etzion. She will be laid to rest Tuesday morning at 10:00 a.m., in Tekoa. She was stabbed to death and two other people were wounded in a terrorist attack at a hitchhiking station outside the town of Alon Shvut in Gush Etzion - the second stabbing attack in Israel on Monday. Magen David Adom (MDA) paramedic Hanan Meyer and MDA senior medic, Abba Richman, who treated the wounded, called the event "difficult." "When we arrived there was a commotion and on the road adjacent to the bus stop lay a young woman of 26 who was unconscious with several stab wounds to her upper body." "We gave her initial medical treatment and transported her to the intensive care ambulance where we performed advanced resuscitation. Unfortunately, after a few minutes we had to determine her as dead." A 26-year-old man who was also stabbed in the attack, and is in light to moderate condition, was brought to Hadassah Ein Kerem in Jerusalem. A 50-year-old, hurt in the jaw and in light condition, was brought to Shaare Tzedek Medical Center, also in the capital. Reports have also revealed that Lemkos was injured in a past stabbing attack almost nine years ago, also in Gush Etzion. "I stood on February 28, 2006 at Gush Etzion Junction when a terrorist came and began to stab those standing at a hitchhiking station," Lemkos said at the time of the incident. "I was one of two people stabbed. Luckily I was not badly wounded, and with the help of G-d, the other wounded victim will recover." "Instead of fighting the settlers, the IDF and the state have to fight the terrorists in Gaza. Instead of evacuating settlers defending the country and serving in the army, the state should evacuate terrorists who fire on the IDF and kidnap soldiers and civilians." "Expel and punish the people who endanger us," Lemkos said, "no matter what the price, on their part, is. They must pay the price for their terror. It is the only way to stop terrorism."